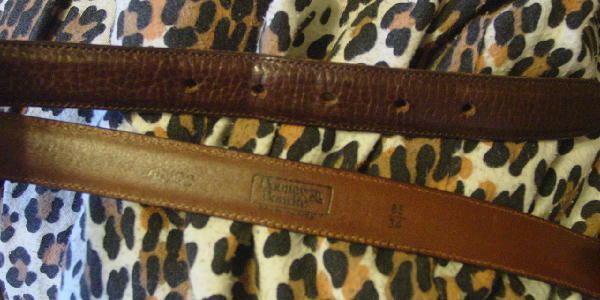 This brown leather belt (see the closeup for more accurate color) is by Dooney & Bourke. It has a solid brass buckle and two leather loops. There is a line indentation behind the fourth hole. The lining is in a lighter color brown, and 34 is printed on the lining. The leather has a few light scuff marks. It's from a New York actor who gained weight. first hole 36 1/2", 4th hole 33 3/4", last hole 32 3/4"